Rim Mason jars with frosting and orange sprinkles, and tie with decorative ribbon. Fill a punch bowl with ice and 2 cups each of chilled orange and pineapple juice. 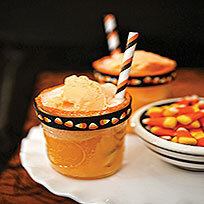 Scoop ½ gallon of orange sherbet into the punch, then add 2 liters chilled lemon-lime soda. Ladle into jars and greet each guest with one. Lightly toast the English-muffin halves, spread them with pizza sauce, and sprinkle on some cheese. 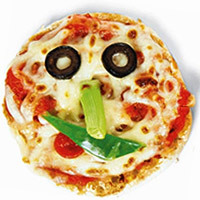 Have each child to make a face from such toppings as pepperoni, olives, carrot curls, and other veggie pieces. Broil briefly to heat the pizza and melt the cheese. Parmesan "dandruff" makes a deliciously vile finishing touch. 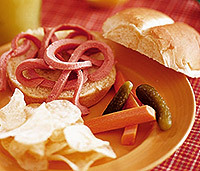 Cut the hot dogs into thin slices and score the edges (about three cuts per slice). Boil or put it in microwave until the slices curl like wiggly worms. Serve three or four worms to a bun. For an extra-icky look, add a few squiggles of ketchup and serve with Putrid Punch (shown in image). For each mummy, separate one breadstick from the roll and use kitchen shears or a knife to slice it, in half lengthwise to create two thinner strips. Wrap one strip at a time snugly around the hot dog. Depending on the size of the hot dog, you may not need all of both strips. Leave about 1/2 inch of hot dog exposed for the face area and continue wrapping the top of the hot dog. 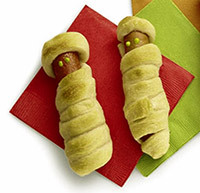 Bake the mummies on a cookie sheet at a temperature of 350º for 15 to 18 minutes or until the breadstick wrapping is golden brown. Remove the mummies from the oven and cool them for 5 minutes. Add yellow mustard eyes just before serving. Prepare 12 mummies like this. 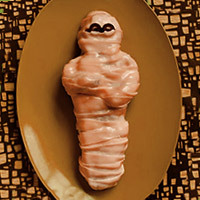 Make your favorite meatloaf recipe and shape the loaf to resemble a mummy's body with crossed arms. Bake the loaf until it's cooked through. Let it rest for about 3 minutes, then lay 1-inch-wide strips of American cheese across the body, leaving a narrow space on the head for the olive slice eyes. Trim any overhanging cheese with scissors and return the mummy to the still-warm oven to slightly melt the cheese, for about 1 minute.